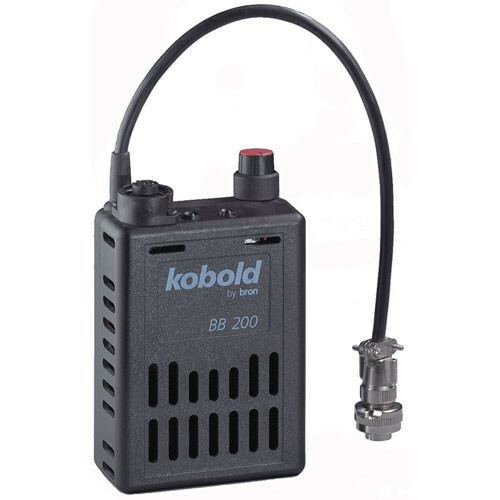 The Kobold BB200/C DC Ballast is for the DW200 HMI fixture. When connected to your 26-34 Volt Battery source, it will provide dimmable power to your fixture, in areas where AC current is not available. The required light output can be set (100 - 60% adjustment range) with the power regulator. Color temperature can change with the power output depending on the type of lamp used. To connect the ballast unit to the battery just plug in the corresponding connection. To disconnect, press the security mechanism on the socket, before pulling out the plug. Green LED is flashing: the battery voltage has dropped to 26V - 22V.